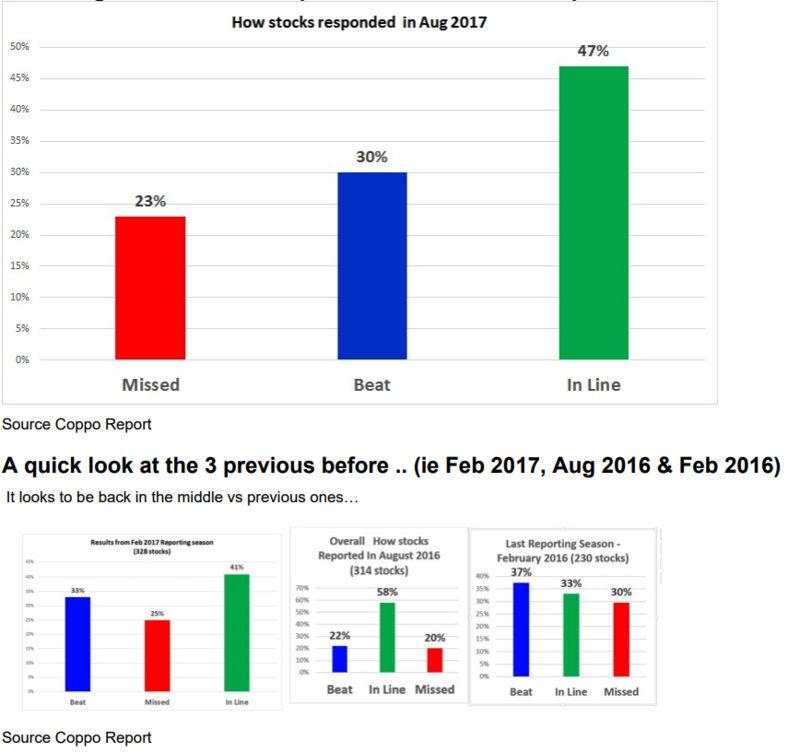 Last reporting season, stocks that “beat” were up +3.10% on the day, and then added an extra +13% to be up +15.7% 4 mths after reporting. The ASX 200 rallied +6.2% over this same time. These stocks had a “lower short interest” at 2.1%, versus 3.1% for the misses. The Misses were smacked -7.2% on the day they reported but the misses have improved by +9% to be (4 mth later) now up +1.5%. But they have been helped significantly by the fact that the ASX 200 rallied +6.2% in the 4 mths since that Aug Reporting season to 15th Dec 2017. 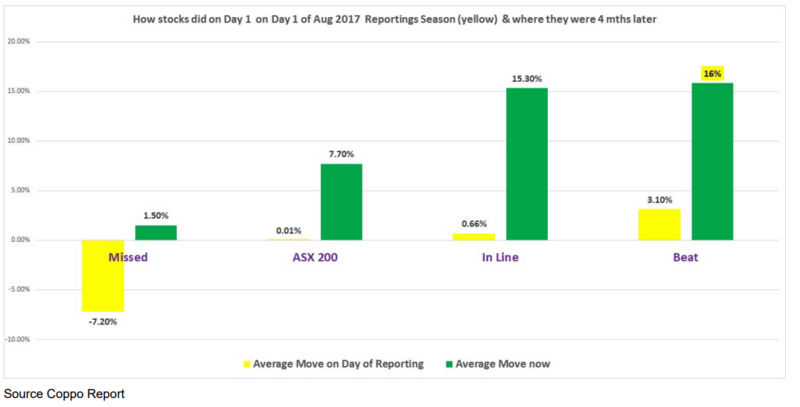 Does the Market get it right on Day 1 of a Company Reporting? However, Beats & Misses can be called arbitrarily: i.e. I may think that a stock that beats on EBIT may be a beat but another may say it’s a miss as the guidance was lower than expected. So to eliminate any human judgment or prejudice. I’ve looked at the stocks 1st-day reaction to the result, to ask: Does the market get it right on day 1? And if so, what does that tell us about: How to interpret the market reaction on day one; What the day one action implies for the stock going forward; is there any consistency in how stock reacts after Day one & then over the following 4 months; and whether the short interest tells us anything. 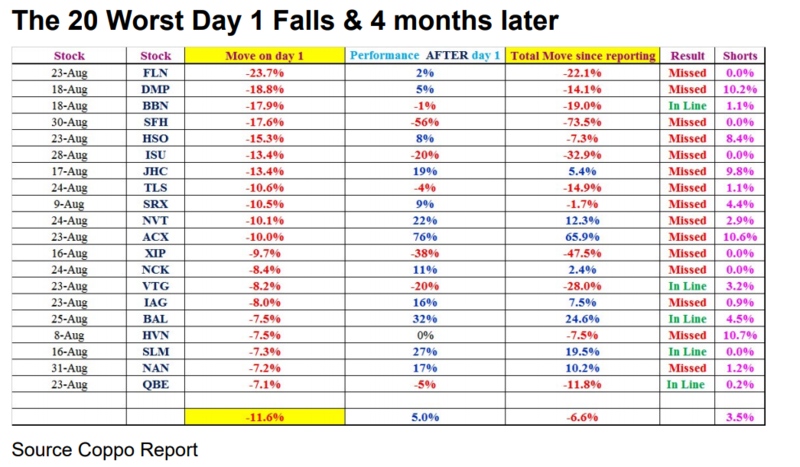 Overall 124 companies were down on the day they reported, fell -4.4% on the day, but in the 4 mths since have recovered +7% to be now up +2.40%. These stocks were up +10.7% on Day 1 (Vs all 151 up stocks that were up on average at +4.3%). Then after Day 1, they have rallied another +18% to be up +29% 4 mths later. 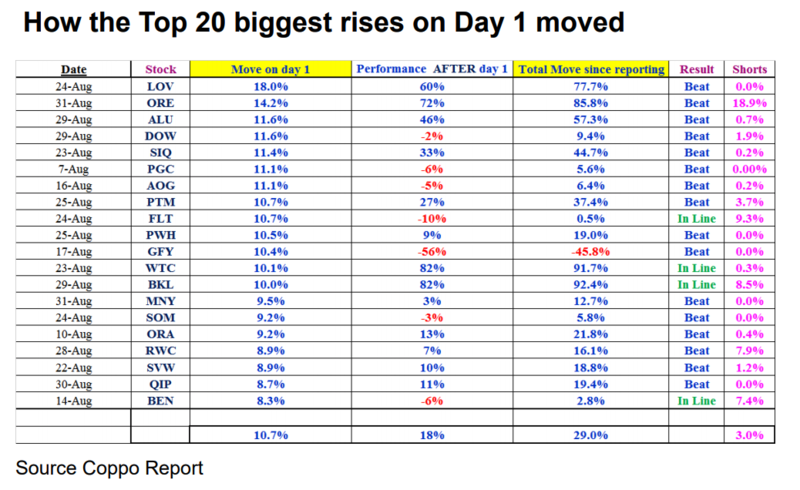 What is interesting here is that the short interest in the 20 best movers on Day 1 was high at 3% Vs the average of all the other ‘up’s at 2.2% and even higher than the ‘falls’ on day 1 that had a short interest of 2.4%… Why ?? Well it seems that if there is a “big short’ & the stock has good news – we’ll see an exceptionally big move on day 1 as shorts are forced to cover & instos weigh in as well. 15 of the 20 stocks “missed”, also the short interest in them was high at 3.5% vs the other day 1 falls at 2.4%. So the shorts were very good at picking these losers. But these stocks were hit so hard on day 1 –falling -11.6% that their move since has been to bounce back +5.1%, to now be down -6.6% overall since they reported. But the ASX 200 has rallied +6.1% in the 4 mths after - so looks like mkt rising has helped them. Of the 8 are now higher than where they were before they reported. So the market may have seen value in these stocks, and possibly as the time to buy them..?